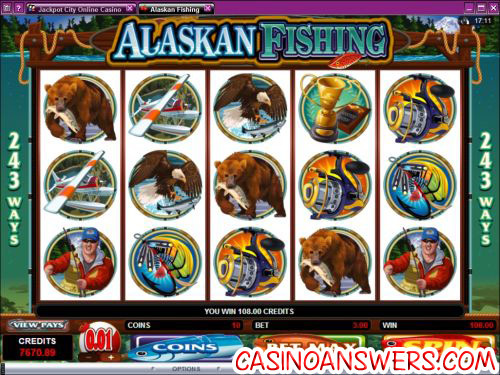 Alaskan Fishing Video Slot Guide & Review - Casino Answers! Alaskan Fishing is a 5-reel, 243-way video slot developed by Microgaming, featuring a wild symbol, free spins and a bonus game. 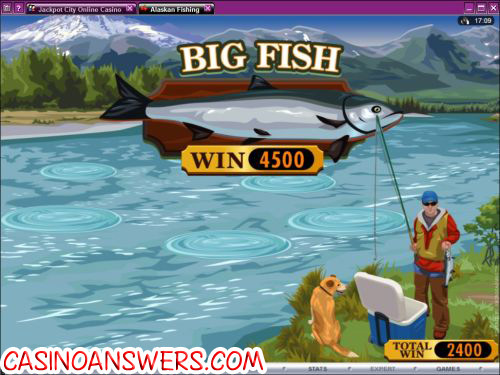 You can play the Alaskan Fishing video slot at River Belle Casino and Maple Casino. Alaskan Fishing is a fishing-themed video slot with symbols representing not only fishing, but the various wildlife you can find in the Last Frontier of Alaska. Symbols include the Alaskan Fishing logo, various fish, a bear, a bald eagle, a plane, a fishing boat, a fishing reel and a fishing hook. The video slot has some nice looking art and plays some relaxing music along with some background ambience. Alaskan Fishing is not a payline slot. Instead, it pays 243 different ways. You do not have the option of changing the number of ways to lower your total bet. It also means there are more ways to win, without being restricted by paylines. To play Alaskan Fishing, you can first select your coin size of $0.01, $0.02 or $0.05. Then, select the number of coins you wish to bet (up to 10). The minimum bet on Alaskan Fishing is $0.30 per spin, while the maximum bet is $15 per spin. Once you’re ready to play the Alaskan Fishing video slot, use the “Bet Max” button to play all 10 coins or the “Spin” button. The Alaskan Fishing logo is the wild symbol. It substitutes for all symbols except for the free spins and bonus symbols. It is also the top fixed jackpot within the slot game, worth up to 500 coins. 3, 4 or 5 Free Spins symbols will trigger 15 free spins with a 2X multiplier on Alaskan Fishing. All wins are doubled during free spins. All bets played in free spins are the same as the spin that triggered the feature. Free spins can be re-triggered. The bonus game can be triggered during free spins. If the bonus game is triggered at the same time as the free spins, the bonus game will play out first. When you hit the bonus symbol (with the man fishing) on reels 1 and 5 at the same time on the Alaskan Fishing video slot, you will trigger the Fly Fishing bonus game. You will have five picks out of nine spots to fish. You will either get a small, medium or big fish and will be awarded bonus amounts of up to 15X your bet. Fly Fishing bonus wins are multiplied by the total bet staked. It is possible to trigger the Fly Fishing bonus game during the free spins feature. If free spins and bonus game are triggered simultaneously, the bonus game will play out first. Wins from the bonus game will not use the multiplier in the free spins feature. From our experience, we triggered the bonus game on our second spin. We bet $3 and ended up winning $108. That made the experience playing Alaskan Fishing a lot of fun. All wins in Alaskan Fishing pay left to right only. Way wins pay according to the Paytable and are multiplied by coins bet. Switching Alaskan Fishing over to “Expert” will give you access to its autoplay mode. Here you can set the number of autoplay spins (up to 500) and set it to stop if a win exceeds or equals ($100, $500, $1000, $5000 or $9999). The autoplay mode will stop on any feature triggered in the slot game. You may cancel autoplay at any time. We are really liking the new 243-way video slots that Microgaming is coming out with, like Alaskan Fishing and Thunderstruck II. More ways to win means more reasons to play! It is no wonder why Alaskan Fishing is one of the most popular video slots at River Belle Casino, where you can get a 100% up to $100 signup bonus to play 400 casino games! Are USA players able to play the Alaskan Fishing slot game? Unfortunately, USA players (including players from Alaska) cannot play the Alaskan Fishing slot machine. For a US-friendly video slot with a fishing bonus game, you can read our Olympic Slots Review. What casinos offer the alaskan fishing slot machine? Where can I get a good bonus with the alaska fish slot?